Providing you the best range of halmark emulsion, cement primer classic, cement primer premium, innova ace, forever acrylic emulsion paint and elleganza acrylic wall paint with effective & timely delivery. 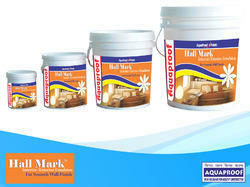 Aquaproof Hallmark Interior & Exterior Emulsion is an acrylic emulsion paint that offers excellent smoothness to touch and elegant, rich finish for interior walls surfaces. It provides the finish and durability of emulsions at a low price. It produce a washable surface. It is resistant to fading and yellowing. Aquaproof cement primer classic is an acrylic copolymer based material which drying fortifies & seals the surface with its high bonding & adhesive properties. It is water thinnable. Applied onall the interior plaster surfaces irrespective of old or new. It does not require any type curing or other coat like cement wash.
Increases coverage of paint, hence it make economical. Reduces efflorescence on the surface. Better adhesion to the substrates. Aquaproof cement primer premium is an acrylic co-polymer based superior primer for exterior. Aquaproof cement primer premium with high grip & bonding capacity is a perfect primer to form a tougher yet flexible film, which adheres wonderfully to the surface applied. It is highly recommended for all kinds of emulsion paints. Do Aquaproof Premium priming before painting. Forming a seal coat which is non-absorbent. Possible to increase coverage of paint. It creates toughness for walls. It gives good support to paint to protect from sun & heavy rain. Aquaproof Innova Ace exterior emulsion paint is a high anti fungal, acrylic emulsion smooth exterior paint offers an economical decorative finish. Innova Ace gives bright colour finish is resistant to fungus / algae, colour fading, peeling & cracking in conditions of rain heat and humidity. high protection ensures durability of surface painted with Innova Ace. resistance to chalking, cracking and weathering in comparison to cement paint. High bonding & superior grip – Innova Ace provides high bonding and a superior grip. 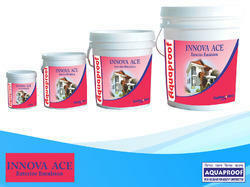 Adhesion to a variety of substrates/surfaces is a speciality of Innova Ace. makes it to withstand harsh climatic conditions. Anti-fungul & anti-algal – Innova Ace contains special additives like fungicides, which make the paint coat resist fungus and algal growth. 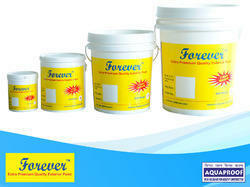 Forever is a water base, modified acrylic emulsion paint for exterior wall. It is an ideal paint for all those structures you want to protect & beautify. Forever painted wall have a smooth and soft feel like finish.Forever can resist colour fading which maintain the aesthetic quality of the painted wall. Foraver provides excellent resistance against the growth of algae and fungi on the wall. Forever gives protection against high rain fall, humidity and heat. It is scratch and abrasion resistant. Forever has high grip and bonding property. Forever is alkali –resistant and thus protects the surface from effloresces. It is algae and fungus resistant. It is resistant to chalking and blistering. Forever is fully protected against UV degradation. 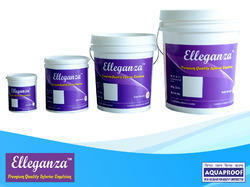 Elleganza luxury emulsion is a premium quality water based, 100% acrylic interior wall finish. It provides a smooth and excellent finish with higher sheen. It has excellent flow and leveling on application. It provides smooth and excellent finish. It resist to fungus and algae growth. It is suitable for use on interior walls and ceilings. It is easy to apply, washable and dirt resistant. 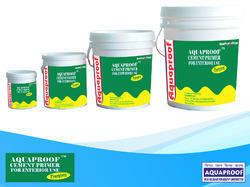 Aquaproof Prestige distemper is water based acrylic co-polymer emulsion based Premium distemper for interior walls only. It is best known for low cost, elegant, smooth, attractive anddurable matt finish paint. It gives smooth finishing to interior wall. It gives shade retention for a long time. 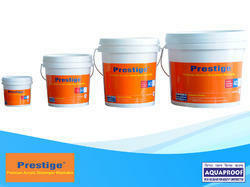 Aquaproof Prestige distemper gives you a smooth paint finish in an economical price. 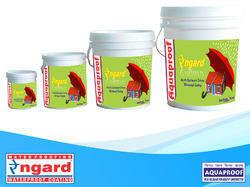 Aquaproof Rain Gard is composed of high quality Acrylic emulsion polymer, properly selected & graded fine fillers, many additives & water as a medium. It is used as a waterproofing & Protective coating for exterior walls of the building because it forms higher film thickness has excellent flexibility breathing properties, water resistance, crack-bridging ability, weathering durability and an excellent resistance to the growth of micro organisms. Flexibility- Highly flexible and covers hairline Cracks up to 0.5 mm effectively so that no ingress of water. UV Resistance- Resistance to UV( Sun light)hence coating has longer life. crack bridging ability & waterproofing properties. Toughness- Tough films withstand wind driven rain. Microbial Resistance- Resistance to fungus and algae hence maintains the aesthetic value. Ease of Application - User friendly, easily applicable by brush, roller or spray. Aqua Sol No Patch, No Crack for your walls. Aqua Sol will gives your walls a new life. Aqua Sol gives more coverage hence it is economical. Aqua Sol PH balance and it give water Proofing. AquaSol the revolutionary for exterior and interior walls. 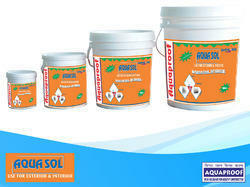 Aqua Sol with an unique formula that protect the exterior and interior walls from cracks and patches. Aqua Sol Save Cost of Paint it consume less paint & more life to painted walls. Aqua sol water base hence easy to use. Aqua Sol will economies in overall painting expenses. 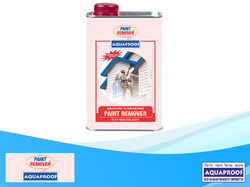 Aquaproof Paint Remover is a single pack highly effective general purpose paint and varnishes remover. It is formulated for interior and exterior use on painted surfaces. It is composed of selected solvent blend incorporated with suitable ingredients. It can be used to remove all kind of paint coating. It is economical in use to remove paint. It is eco-friendly in use. It is easy to apply you can do it your self.